Instead of Take 5 Tuesday, we're taking 7 and we're doing something new here today! 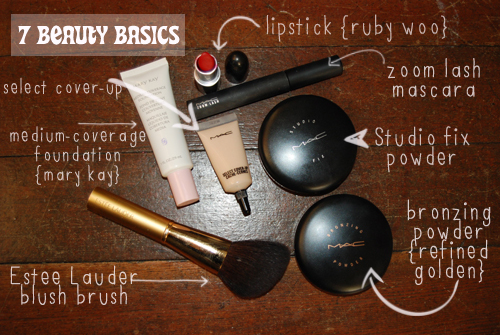 I wanted to share with you 7 of my beauty basics that I cannot live without. After I share mine, I want to know about yours!! While I'm not totally partial to MAC cosmetics, almost all of my makeup I'm sharing today is by MAC. What I love about their products is the way it works with my skin type, tone and how it always photographs well. 1. Lipstick: Ruby Woo by MAC - This lipstick has a matte finish and is the perfect base. Put a little gloss on top of it and you're golden. 2. Mascara: Zoom Lash in Zoomblack by MAC - While I don't wear mascara everyday, this is perfect for whenever I want to. You can layer it or just apply one coat and it does the job pefectly for me. 3. Powder: Studio Fix Powder by MAC - I don't use this everyday either, however when I don't feel like putting too much foundation on, or if I just want to retouch during the day I'll use this. 4. Bronzing Powder: Refined Golden by MAC - This along with my blush brush has been in my beauty routine for the longest of all. I wear this year-round and have been wearing it for a good 8 years. If it works then why change it, no? 5. Blush brush: Estee Lauder powder brush - I've had this brush for many years. I think I paid $50+ for it back when I purchased it however it's lasted me close to 10 years. I think it's made out of horse hair. With proper care and cleaning they last a long time! You get what you pay for! 6. Liquid Foundation: Medium-Coverage Foundation by Mary Kay - This is just the right amount of coverage for me. It has the perfect consistency, not too thin or thick. 7. Concealer: Select Cover-Up by MAC - I'm not going to lie, this does wonders under my eyes. When I've had little to no sleep, this makes me look like a spring chicken. Now that I've shared with you most of my beauty products, I'd love to hear 7 things you cannot live without. I didn't include my eye shadows, liners, brushes, etc. because I can live without them. Do you use any of these products? Hi Joanna! I'm familiar with your lovely blog! :) So happy to have you!